This latest installment of the Redwall series strikes a wonderful balance between classic Redwall adventures and something new, which is essential for part of a long-running series. Like most of the recent books, Doomwyte is set an unspecified number of seasons after the events in Redwall, but as near as I can tell before the books and records were moved from the Gatehouse into the library in High Rhulain. The story itself stays pretty tightly focused on the Abbey and its surroundings, which is a change from many of the other books in the series which range from the northlands to far-flung islands and the great mountain Salamandastron on the shores of the sea. I enjoy both types of stories, and I am very happy to see that Brian Jacques can tell both equally well. 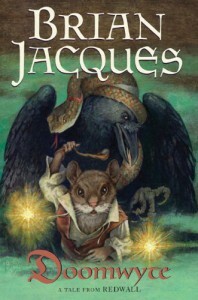 Doomwyte also draws more heavily on spooky and supernatural elements than most of the other Redwall novels, and I quite enjoyed that difference.